On Sunday night, a Tesla crashed in North Brunswick, New Jersey, reportedly veering off the road and hitting several signs before finally stopping. The driver wasn’t hurt, but the vehicle did sustain extensive damage. It wasn’t a particularly remarkable accident, other than the fact that the driver claims he could have prevented it — if Autopilot would have let him. The spokesperson also explained how Tesla designed the system to prevent the type of scenario described by the driver. Based on the available information, it appears more likely that this was a case of driver error than Autopilot refusing to relinquish the wheel. However, it could be a sign that as self-driving cars become more common, we could see more and more drivers blaming their vehicles for their own mistakes. Given that possibility, it’ll be essential that manufacturers equip their self-driving systems with the ability to record second-by-second accounts of just who’s in control of a vehicle. The police didn’t issue any charges against the Tesla driver in this case, but it’s not hard to imagine a scenario in which other drivers use “the Autopilot did it” as their defense when faced with any number of traffic violations. 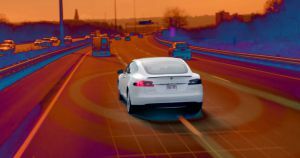 The post Tesla Driver Claims Autopilot Wouldn’t Let Him Prevent Crash appeared first on Futurism.